Giant hogweed has been causing somewhat of a stir in the news lately. 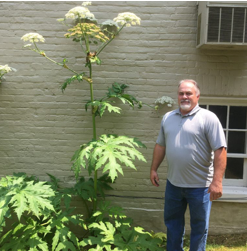 Since Virginia Tech confirmed a number of plants at a residence in Clarke County, VA, some Lincoln County residents have been alarmed to find plants that resembled the giant hogweed plants they have seen in news photos. Fortunately, these local plants have turned out to be smaller, common, safer plants, known as Queen Anne’s lace. Though a number of plants have forms/flowers similar to giant hogweed, knowing the scale of giant hogweed plants may help with identification, and ease unnecessary fears in the case of a misidentification. Giant hogweed can exceed 6 feet in height, with reports reaching 14 feet, with more than 3 foot long leaves and a huge flower head, up to 20 inches in diameter! This alone distinguishes it from a number of impostors. Giant hogweed does exist in NC, but thankfully there are only a few known infestations, and the North Carolina Department of Agriculture is working to eradicate those populations. It is good that this effort is underway. Giant hogweed is an invasive plant, and is indeed a concern. The sap of the giant hogweed, in combination with moisture and sunlight, can cause severe skin and eye irritation, painful blistering, permanent scarring and blindness. By simply brushing against the bristles on the stem or by breaking open the stem or leaves, it is possible to have significant contact with the sap. If you think you have spotted giant hogweed in Lincoln County, you can send photographs to tom_dyson@ncsu.edu. I would be glad to take a look. Be sure to include clear photos of leaves, stems, and flowers, with an indication of scale (something in the photo of identifiable size for comparison).